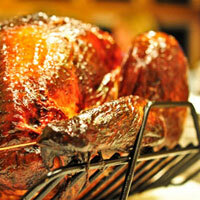 There are several ways to cook this beer brined turkey. 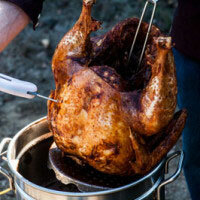 This method teaches you a safe way to deep fry a turkey (see Safety Tips below). 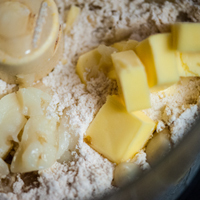 For other cooking techniques of this recipe, there are links to all the ways this base recipe can be cooked below. This recipe yields enough brine for a 16 – 24 pound turkey. The fastest way to cook a turkey is placing it into a hot cauldron of oil. Because of the large size of a turkey and the displacement (or amount of space it occupies) and thickness of skin/meat/bone, a smaller sized turkey (no larger than 16 pound) is better for frying. This will require less brine submersion time. Yet, the turkey will need more dry time post brine, to make it safer to fry it in the hot oil. The moisture of the turkey is an important factor in its deep fat frying voyage. Whether you are just frying a bird right out of the wrapper, injecting it with beer or beer brining, it is important to know this important fact of culinary science: moisture when mixed with hot oil creates steam. This water vapor causes oil to bubble and boil. The less moisture present on and around a turkey will dramatically reduce the amount of bubbles caused by steam and make frying a turkey a lot safer. Dry the turkey very well with multiple wipe downs with many paper towels both inside the cavity and around the skin at every joint. The goal is to try to get the skin as dry as you can. Once the skin is dry, get your brew or stock pot out. The size of the cooking pot matters. 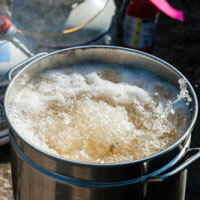 Make sure you have a large pot, a stock pot or brewing pot with at least 8 gallons of holding volume. Fill your pot about half way with a good quality fry oil. I like to use oils that have a higher smoke point, so that they don’t burn when cooking. Having the right type of oil and monitoring the heat source from going too high in temperature will prevent the oil from burning. Oils with a higher cooking temperature (smoke point) making them great for frying are rice bran oil (490°F | 255°C), peanut oil (450°F | 233°C), sunflower oil (440°F | 225°C). Rice bran oil is the most expensive, but will create a wonderful flavor and will be a long lasting oil, being able to use it a few times for multiple turkey cooking (or filtered and used at another time). 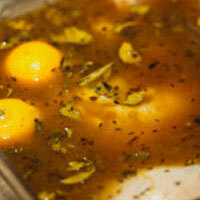 You will need approximately 2 ½ - 4 gallons of oil. The ideal amount of oil, is when the turkey is fully submerged into the hot oil, there will be at least 2 inches of oil above the turkey. More than this could get the level of the oil too close to the edge of the pot, which could bubble over, causing a potential fire hazard. If you use a 10 gallon pot, you will need more oil, like 5 gallon. It is also important to place the cooker/burner (a brewing burner or propane burner like a Cajun cooker) in a safe place away from anything that might catch fire (bushes, trees or other landscaping), on level ground, not close to the house/garage, on dirt or a cement ground (not a wood deck). Place the pot filled with oil over high heat. Once the oil reaches 375°F | 191°C the turkey is ready to be added. Make sure your turkey is free of all plastic (sometimes there is a plastic piece near the tail bone, that is used to hold the legs together or a pop-up thermometer (if using such bird). Also remove any excess fat from the opening of the cavity. if you haven't done this already. The next thing to consider is how to get the large turkey in and out of the hot oil safely. Here are a few different options and things to consider: The String Method: truss the whole turkey with a good kitchen twine, creating a good sized loop at the end of the legs, so you can grab it and retrieve the turkey from the oil. Using a long pair of long kitchen tongs, put the handle of the tongs through the loops of the twine from the legs. 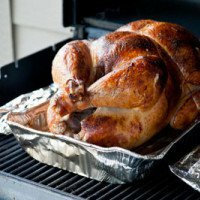 This isn't the easiest method to get the turkey in and out of the hot oil, but it is the cheapest and if you aren't planning on frying many turkeys, this technique will work. The Fry Basket Method: a large fry basket that has holes in it, with a large enough diameter to hold the turkey around the breasts. Make use this basket fits the diameter of your cooking pot. These holes will allow the oil to drain in and out of the basket. This fry baskets usually have a handle that you can use to lift the basket in and out of the hot oil. 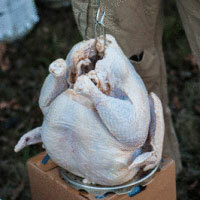 A separate hook/handle is then used to lift the turkey. 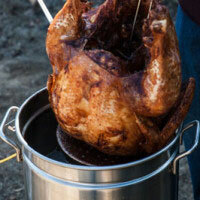 The Turkey Stand Method: The last way to safely remove a turkey from a deep fryer is if you have a turkey stand. 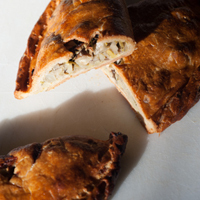 These sometimes come with a deep fry turkey kit. The stand has a base and a long loop/pole that goes inside the cavity of the turkey and comes out the neck (or putting the loop through the neck and out the cavity, reverse the position of the turkey being right side up, or upside down). Turn off the flame before adding the turkey. This will help remove the risk of any oil bubbling over the sides and down to the heat source, causing a fire. Put on some kitchen gloves, to protect yourself (steam will be created when the turkey is dipped into the oil) and get the turkey. Now, carefully dip the turkey about 1/3 into the hot oil, not completely submerge it. Retract the turkey after 30 seconds and repeat, watching each time the turkey is dipped and the amount/size of the bubbles in the oil. As the remaining moisture dissipates, the turkey can go deeper into the oil, repeating until the whole turkey goes in and the there is no issue with the oil bubbling over the edge of the pot. This will take a few minutes and some strength to do. Once the turkey is fully submerged in to the hot oil, take some paper towels and wipe the outside of the pot being used. If any of the oil bubbles boil over the edge of the pot, the drips dribbling down the sides can potentially catch on fire. That oil will also cake on to the side of your pot, making cleanup that much longer. The temperature of the oil will have dropped significantly. This is not a problem. Turn/re-light the heat source and bring the temperature of the oil to 350°F | 177°C. Adjust the flame to keep as close to this temperature as possible. Periodically, using a hook, lift the turkey partially out of the oil, to re-distribute the oil, replacing hot oil into the center cavity of the turkey, helping the turkey to cook as evenly as possible. As the turkey is cooking, have a clean pan/rack ready to place the turkey into when its done cooking. It should take about 30 – 35 minutes to cook a 16 pound turkey. Many different variables affect the cooking time. The temperature and volume of your oil, the BTU or flame strength of the burner, the temperature of the turkey when it went into the oil. The size of the turkey. 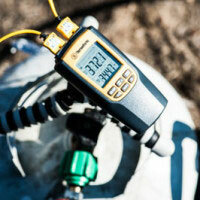 Because of all these variables, I like to use an instant read probe style thermometer to check the temperature. The internal temperature should read 155°F|68°C and the turkey is done. Check the temperature of the breast meat, making sure the tip of the probe isn't touching a bone, or you will get a false reading. Also check the temperature of the thigh, again being careful to not touch the bone. Once the turkey comes to temperature, let the cooked bird drain any oil for a minute. 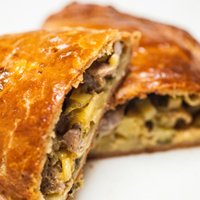 Place onto the rack, cover with aluminum foil and let rest for 20 - 30 minutes. The carryover heat from the deep frying process will finish cooking the turkey to a safe 165°F | 74°C. With turkey meat much like it's fowl cousin chicken, there isn't a ton of unique flavor; it's very subtle. I have found that using beers that use a good percentage of melanodin malts add a rich flavor to the turkey, enhancing the maillard reaction that occurs during the cooking process. Beer styles like German Bocks, Doppelbocks, American Brown Ales, English Brown Ales, Dunkelweizen, Vienna Lagers, Roggenbier, Scotch Ale | Wee Heavy, Irish Red Ale and Märzens | Oktoberfest all compliment the flavors of turkey with this beer brine recipe. 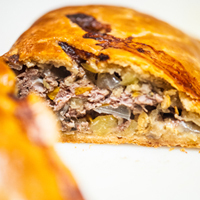 Below are some other beer style and brewery versions of this recipe, each adapting the beer brine to fully utilize the beers nuances in flavoring the turkey. A roll of paper towels nearby to wipe up any spills, clean hands, etc.